If you are at a place that it makes sense to have your parent(s) or in-laws move into your home but do not have the room for it, then building out a basement apartment is the perfect choice for you. Building a bedroom with room for a queen size bed, night stand(s), dresser drawers and closet space so they can sleep comfortably. Living room area that would include room for a couch, coffee table, end table as well as a flat screen TV. And, make sure to wire for cable and to give them internet access too. 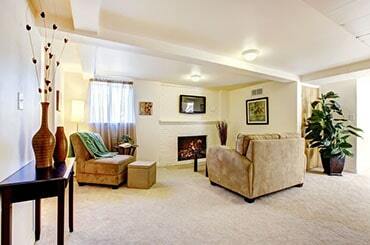 Room for a fireplace, then we highly recommend that you add it to your basement apartment. It adds to the ambience of the basement, and it keeps the basement warm when being used. Compact Kitchen Area complete with stove, oven (with exhaust system), cabinets, sink, dishwasher (if possible), refrigerator and microwave. Plus make sure to have room for a small dinette set and proper lighting. Build a bathroom that is open and easy to get around. If your in-laws are older, putting as few barriers in the bathroom and shower as possible to make it easy to get around. Grab bars and easy in-and-out shower stall with a seat would be helpful as well. Privacy and soundproofing is very important when building an apartment in your basement, for both your in-laws and you. This would not just include the walls, but also enclosing the stairwell for complete privacy. For comfort, having proper Heating, air-conditioning and humidity control is a definitely something that any finished basement should have. Wireless Intercom system for communicating with your in-laws. Smoke and carbon-monoxide detectors, to help protect everyone in the home! These are just some of the considerations when creating a Basement Apartment for your In-Laws or even if it is rent out for additional income. If you are looking to have a fully functional basement apartment built-out in your home, please contact us to schedule an appointment by either calling us at (303) 829-3374 or to email us, Click Here.